Hot off the press is A Chameleon’s Tale, and I was honored to be sent a publisher’s proof copy before printing. 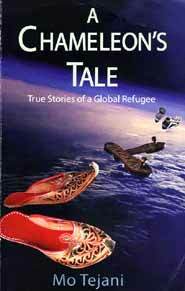 Written by Mo Tejani, it is (on the surface) a travelogue of a wanderer who is seeking his true niche, a place he can call home. I took the book with me on my last flight to Chiang Mai, and I was disappointed when we got there, requiring me to put the book down. Written in a conversational, easy-to-read style, Mo Tejani takes you from his birthplace in Africa, around the world and even to his country of parental heritage, India, and eventually arriving in Thailand, and Chiang Mai in particular. Not only does our Mo have cultural ties with many countries, but he also has the added problematical ingredient of religion. He describes very well the family anguish that ensued after Idi Amin’s unilateral decision to expel the Asians from Uganda, including an insight into bureaucracy which would split up a family unit because not all passports were from the same country. On his travels through the world, Mo Tejani writes of the influences upon him from many mentors, and of the nights of congress with women travelers, which I have to say becomes a little tiresome, but does not take away from the main thrust of the book. As Mo continues his journey, he becomes more and more skeptical of the work done in the name of do-gooders, and his final analysis should make some aid organizations cringe. Unfortunately, both Mo Tejani and I know this will not happen! They are too well entrenched, and well funded to listen to lone voices in the wilderness. In the words of Hotel California, “We are all just prisoners here, of our own device”, which in many ways goes to explain much of the expat presence in Thailand. And as the song carries on, “Relax said the nightman, we are programmed to receive. You can check out anytime you like but you can never leave!” Perhaps explaining while we (and Mo Tejani) are still here. An interesting, deep, and yet entertaining book and well worth the B. 450 price tag at any major booksellers. You will see yourself in this publication. We wanderers have a common bond! There is no doubt that of his time David Bowie is a Star, a genius; some of his work will go down as seminal in the history of rock ‘n’ roll. Nobody but a fool would try to contradict this. But the peaks have been as high as the troughs have been low. It only also takes a very brief examination to see that most of the peaks came in the early Seventies, whilst since then his work has been patchy to say the least. Upon closer inspection, it is noticeable that his truly great work has always been done in collaboration with other artists, who very rarely get the credit they deserve. A bit like Mott the Dog in collaboration with firstly Ella Crew and then Meow The Cat. Always grab the credit if you can! After an unsuccessful debut album in 1967, two years later, on the strength of the song ‘Space Oddity’, a new album ‘Space Oddity’ (1969) was rush released full of David Bowie’s new songs. This too was of little merit. David Bowie then seemed destined to be regarded as a one hit wonder, which infuriated the young Bowie, as he saw all his peers rushing to superstardom, such as Marc Bolan, Elton John, Bryan Ferry, etc. Fortunately Mercury records could see some talent in the rather odd looking young man, and invested some more studio time with him. By this time David Bowie actually had a regular backing band behind him. A rhythm section of Woody Woodman’s on drums, Trevor Bolder on bass, and most importantly of all Mick Ronson on lead guitar, who also doubled up as musical director. This was the dawn of ‘David Bowie and the Spiders From Mars’. The resulting album was brilliant; a mixture of hard rock with catchy tunes and perfect hooklines. But although David Bowie was around to write the lyrics and sing the vocals, apart from that he pretty much left the band to get on with it. When the album was released it came out solely under the name of David Bowie with the title ‘The Man Who Sold The World’ (1971). Just to put one more spoke in the wheel, David Bowie insisted upon a cover of himself dressed in drag. In 1971 this was more likely to get you beaten up than garner a round of applause. Various record shops refused to stock the album, and by the time the album cover had been replaced the damage was done. Nonetheless, the songs were full of promise and the guitar work of Mick Ronson spectacular. Because of all the controversy Mercury dropped David Bowie like a red hot brick. RCA was able to see the possibilities, though, quickly signing up David Bowie with his band. Recording a new album ‘Hunky Dory’ (1971) and getting it out on the streets within six months. This helped repair the damage and got the buzz going about David Bowie. Six months later and another album was ready, a concept album no less. ‘Ziggy Stardust And The Rise And Fall Of The Spiders From Mars’ (1972). Every song a classic, quite possibly the album of the year, definitely changing the face of rock ‘n’ roll forever. In just over a year The Spiders from Mars had become the tightest unit around and the biggest draw on the concert circuit. Mick Ronson’s guitar playing on ‘Moonage Daydream’ was to become legendary. The rhythm section was unbeatable and the avant-garde Mike Garson had been added on keyboards. From here on David Bowie and The Spiders From Mars could do no wrong. The following year produced the equally brilliant ‘Aladdin Sane’ (1973) and a covers album ‘Pin Ups’ (1973). Every concert was sold out, rave reviews, they were the darlings of the media, thousands of fans worldwide. Then to everybody’s disbelief at the end of a long sold out U.K. tour from the stage of the Hammersmith Odeon to the surprise even of the band David Bowie split up ‘The Spiders From Mars’ forever. In the following years, David Bowie put together ‘Diamond Dogs’ (1974) and ‘Young Americans’ (1975), which weren’t bad, but ‘Station To Station’ (1976) is one of the worst albums ever to be released on an unsuspecting paying public. The results of this album have often been blamed on the excesses of David Bowie’s rock ‘n’ roll lifestyle, and the fact that he was burnt out. If this was the case don’t release the album. The title track opens with the line: “The return of the thin white duke throwing darts in lovers eyes”. Well if this was the return of the thin white duke I am glad I never met him before, and I hope he never comes back again. There are only two good things about the title track ‘Station to Station’ – firstly, it opens with the sounds of a locomotive pulling away from the station and if I was you I would get on that train and leave. The second thing is that it drags on for over ten minutes, which means that you can at least runaway before the next track starts. ‘Golden Years’ is the second track which David Bowie’s remaining fans turned into a minor hit single. Thankfully there are only six tracks on the album, lasting an excruciating thirty seven minutes, forty-four seconds. But amazingly, after the first two tracks things get even worse, the biggest crime of all being that obviously with no inspiration left at all, for the final six minutes David Bowie murders a cover of Tiomkin: Washington’s ‘Wild Is The Wind’. To add insult to injury the record company did not even bother to do any new artwork for the album, simply taking some of the rejected photos from Bowie’s film ‘The Man Who Fell To Earth’ and slapping them together. If this album had been submitted to any record company by anybody but a big name like David Bowie it would not have been released. Earl Slick and Carlos Alomar do produce nice guitar solos on some of the songs, but what Roy Bittan from the E-Street band is doing on here I do not know. The following year David Bowie moved over to Berlin, Germany to lick his wounds and collaborated with Brian Eno to produce the marvelous ‘Low’ (1977), and later that same year the album ‘Heroes’ (1977) had its moments. But Bowie was never again to reach the creative peaks of those early Seventies albums. 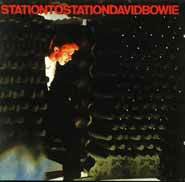 Deservedly David Bowie has a reputation as one of Rock’s great artists, but not on the basis of Station To Station.